Island Creek Oyster Bar Burlington Hosts Beaujolais Soirée: Sunday, November 18th - Nov 18, 2018 - Burlington Area Chamber of Commerce ? 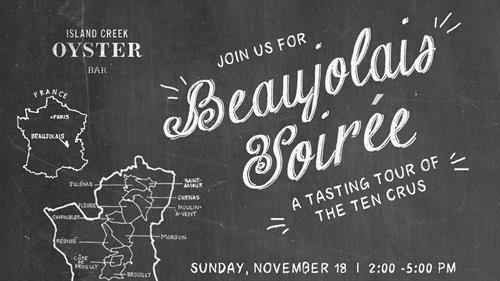 Join the team of Island Creek Oyster Bar Burlington as they host their second annual Beaujolais Soirée on Sunday, November 18th. Ten wine professionals will be on hand to help you learn about the nuances and regional differences of the 10 crus which make Beaujolais so diverse and delicious. Chef Matt Celeste will be providing perfectly paired bistro fare. Find great new wines for your Thanksgiving table while you spend the afternoon touring this often overlooked and misunderstood region of France. Tickets are $60 in advance or $75 at the door. To purchase tickets, email: lstaley@islandcreekoysterbar.com.